Is your dog scratching its ears driving you mad ? Are they waxy, smelly and gunged up ? Have you tried other products and nothing seems to work ? Well, this does work GUARANTEED! What you need is an effective dog ear cleaner. One that will clean out the wax and any dog ear mites and get rid of that horrible smell! You need EarSolv – we are so confident in our product that we offer a 100% no quibble guarantee and we post it first class mail. So what have you got to lose? Scroll down to the “Shop Now” button below and your best friend will be ever grateful. EarSolv will gently clean out all the wax and debris …….Guaranteed! Your dog’s ears need to be regularly monitored for his entire life especially if he is prone to developing dirty, waxy ears. He may be the type of best friend who loves to plunge into water, roll in mud …or worse. 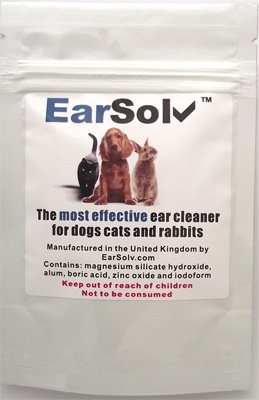 You will be amazed how quickly a small amount of our specially developed powder, EarSolv, will dry up and gently clean out the ears. If your dog is a long coated dog then he may need to have the hair inside his ears gently removed as this can trap excess wax and moisture. EarSolv is also great at enabling you to easily grip the longer hairs before gently pulling them out a few strands at a time. EarSolv is so effective that we offer a no quibble 100% money back guarantee. Lets face it, he deserves it! So easy to use, pleasant smell, and it works! 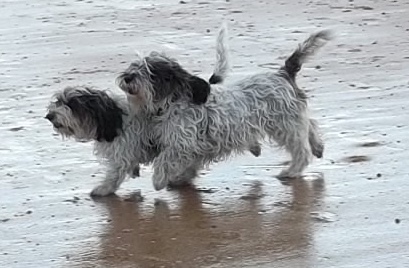 My dog started to show signs of ear mites, the brown waxy stuff in his ear, foul smell, constant ear scratching and shaking, causing him to cut himself and bleed a bit. Used this once a day for 5 days and it cleared it up amazingly. 5 weeks on and still no sign of the mites returning. Works perfectly, with out a lot of fuss and bother like with ofther products i have tried. You will not get a better price on a 50 gram sachet anywhere else. We have carefully selected a secure online payment gateway that is highly regarded and trusted throughout the internet. We offer a no quibble guarantee – if it does not work for you we will refund you in full.